Gents Hostel is located inside the campus. The three floor building with a total capacity of 32 rooms which accommodates 4 members. 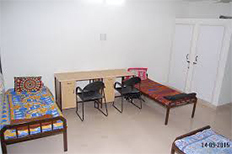 Each student is provided with a cot, table,chair, shelf and cupboard in their respective rooms. Each room is provided with a ceiling fan. Out of 32 rooms, 12 are attached. There is one common prayer space, recreation space and one office room in ground floor. There are study areas in each floor. To involve in group studies, the students can make use of the study hall. Here the visitors, parents and other outsiders are allowed to wait. Electrical & Electronics Engineering Dept.